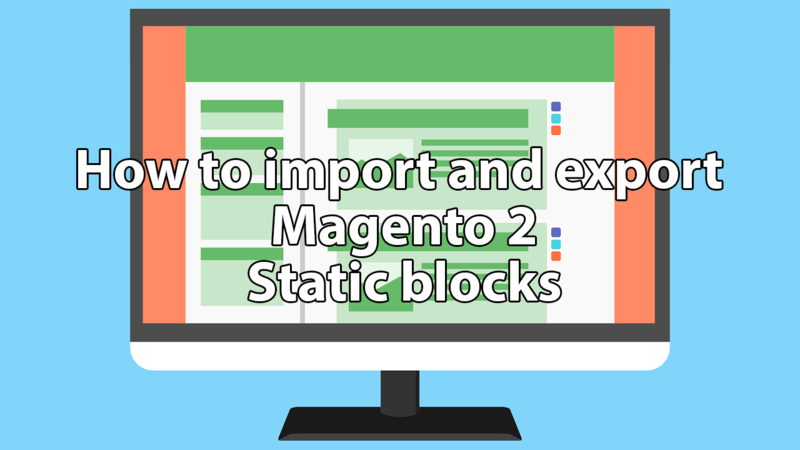 In this article, you will learn how to import static blocks (or CMS) blocks to your Magento 2 store and how to export them. Including blocks composed with Magento 2 Page Builder. Along with the step-by-step instructions, you will find explanations on every static block attribute and sample files you can use as a reference. Your Magento 2 store consists of CMS blocks and pages. When creating a new store or updating existing one you are probably composing new blocks, assign them to pages, and decide where you want these pages displayed. So, static blocks or CMS blocks as they were called back in Magento 2 days. These are you ‘Lego-blocks’ when composing and building store content. Static blocks can be anything: widgets, banners, sliders, etc. When it comes to optimizing workflows, if you are building several typical stores, or want to migrate from one to another, composing static blocks manually take much more time than intended. That’s why in this article we will describe how to import static blocks. For importing and exporting static blocks, including blocks composed with Magento 2 Page Builder, we will be using Improved Import and Export extension for Magento 2. The extension is a full-featured import/export tool that can help you reduce the store management time by offering automated product catalog updates, order updates, and import and export of every Magento 2 entity you can think of. Import and export of all product types, product attributes, orders, categories, static blocks, CMS pages, cart price rules, MSI and other. Import and export of B2B entities, such as: companies, requisition lists, shared catalogs, quotes and negotiable quotes. 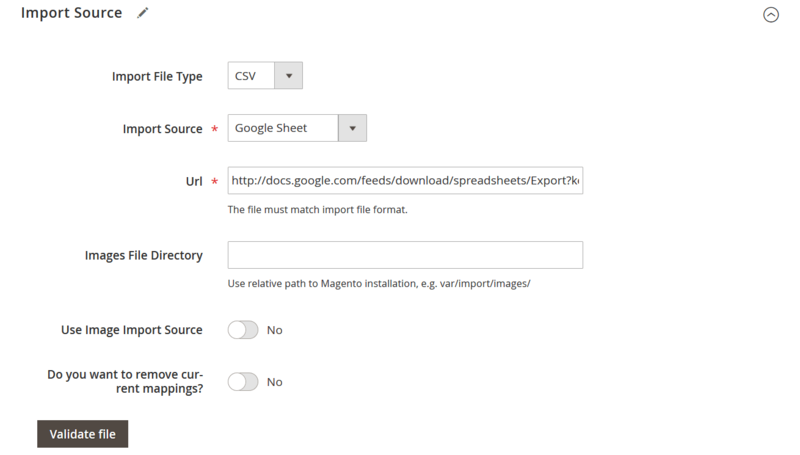 Support of direct file upload, FTP, SFTP, direct URL, Dropbox and Google Sheets as import sources. Support of CSV, XML, Json, XLSX, ODS file formats. Mapping of CSV file separators and attribute mapping. Filers and conditions including price, category, and other entity attributes. Import speed of ~3000 per minute on a decent server configuration. This is just a small part of all the features available in Improved Import and Export extension. For the full feature list refer to the product page. In the Master Import Table for Magento 2 – a Google Sheet table where we have gathered sample tables with every Magento 2 entity. Every attribute of every entity comes with a description, explaining how to use this attribute, and a sample value to give you better understanding of how the table works. In the Firebear Studio GitHub. At the GitHub we have gathered sample tables of different formats including CSV, XML, Json, XLSX, ODS with every Magento 2 entity you can import and export. You can also find other sample files with XSLT templates and a readme file explaining how everything works. Alternatively, if you have already installed Improved Import and Export extension you can try exporting the static blocks you already have at your Magento 2. Once installed, Improved Import and Export extension introduces its sections to System > Improved Import/Export. There you can get access to the import and export jobs – a basic set of settings that let you perform manual or automatic import or export of required entity, in a required file format, on set conditions. If you proceed to System > Improved Import/Export > Export jobs you will see an export job grid where you can create new jobs and manage existing jobs. 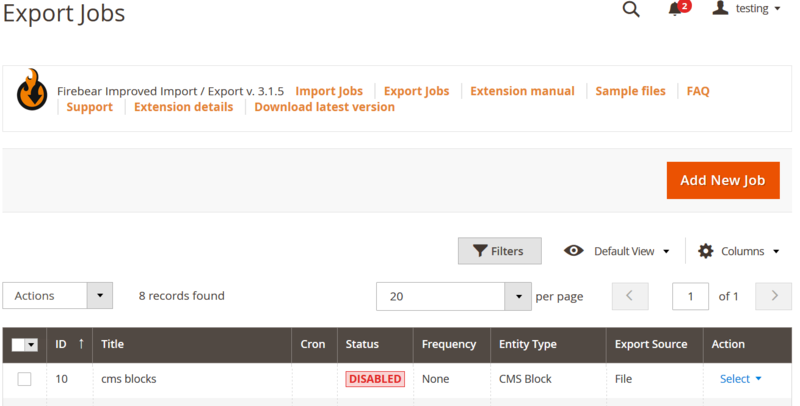 The export job grid comes with the set of filters and mass actions just as every other Magento 2 grid. In the General Settings of the export job you are suggested to specify the job name, set the job schedule if you want to execute it manually, and if the schedule is set – enable or disable the job to run automatically. You can also set up a Consecutive Export – if it is enabled and the export job is set to run automatically, every consecutive execution of the job will only export NEW entities, that have been created in Magento 2 since the last execution of the job. For example, if you are running the export jobs on a weekly basis, the consecutive jobs will let you export only the entities that you have created in your Magento 2 store the last week. In the Export Behavior, you decide on the file format you want to export the data into and set the export file separator values. And specify the path to the file the data should be exported to. The files are created automatically and can be downloaded right from the export job screen after the export is complete. There are also other settings available in the export jobs, such as attribute mapping and filters. You can find a description of all these settings in the Improved Import and Export extension Manual. Once you are done with the export job settings, click ‘Save & Run’ button and execute the job. The static blocks will be exported to the specified file format. So, you have either exported or downloaded a table with static blocks. Now we can proceed to explain how one can edit such tables. Below, I will be explaining all attributes available for static blocks and how to edit them. For reference you can use Static Blocks sample table from the Google Master Import table. store_view_code The code of the store view the static block belongs to. Can contain multiple store view codes separated by comma without spaces. NOTE: you can export and import blocks composed using Magento 2 Page Builder without any issues. The contents of such blocks are stored regularly in the ‘content’ column. You can also edit these contents manually if required. That’s it, these are all the static block attributes that can be exported, edited and imported. The import process is similar to that of the export. To import static blocks using Improved Import and Export extension proceed to System > Improved Import/Export > Import jobs screen to find the import grid. The import grid offers the same functionality as the export grid. You can filter already created jobs, edit the jobs directly from the grid, or create new jobs. Create a new job by clicking ‘Add New Job’ button. In the General Settings of the job you are suggested specifying job name, schedule and other settings that can be found in the Improved Import and Export manual. In the Import Settings you decide whether you want to use API connection, REST or SOAP, and specify the entity you are importing. In this blog post, we stick to the CMS blocks. Delete – entities from the imported table will be removed from the store. Replace – entities with the same ID and identifier will be replaced. Along with the behavior you control allowed error count and can map imported file for separators. If you are following this blog article instructions, you can import the sample static block table from the Google Sheet Master Import table we’ve talked about earlier. When the table you are importing is uploaded you hit ‘Validate file’ button and let the extension check the file for proper data format. Then you can click ‘Save & Run’ button and execute the import job. There are other settings available for import jobs, to learn more about them – refer to the Improved Import and Export user guide. That’s it. 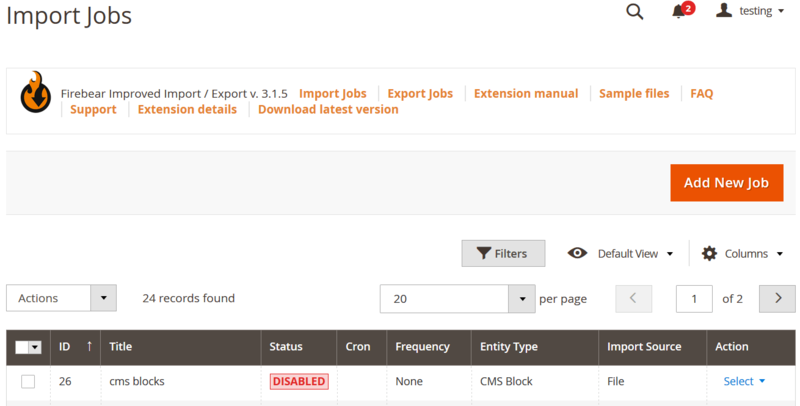 You now know and understand how to import and export CMS static blocks to your Magento 2 store. If you require further assistance or have any questions – don’t hesitate to contact us via chat or support ticket. Read other import/export Guide List posts.